THIS IS A 5 DAY PRIME MISSOURI DEER HUNT ARCHERY OR GUN, GUIDED OR UNGUIDED ON OVER 2,000 ACRES OF PRIME MISSOURI FARM GROUND. 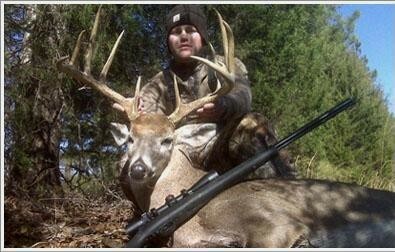 Guided or DIY hunt you choose what suits you in this prime deer property. Prices discounted $ 500 down to the low prices below detailed below. This outfitter leys you decide if you need his help or not. A deposit of $1000 is required when booking and balance due 30 days before the hunt. Archery semi-guided (No lodging, meals, or guide, just a map and a tour of the property only $1200.Our guided Gun hunt includes staying at our lodge, meals, and of course your guide for only $1950. Lodging/Meals/and guide: Included in the guided hunt only. The semi-guided do it yourself hunt is access to the tree stands, a tour of the property, and a map of the property. These dates are tentative and are set by the DNR. Turkey Spring Mon, Apr 20, 2009 Sun, May 10, Spring Turkey Hunting booklet information. We don’t offer a muzzleloader hunt to allow our deer to go into the winter in the best condition possible so that we can be provided with a maximum fawn crop and antler growth. Archer & Rifle Hunts can be a number of different configurations and prices to match. As a norm the deer taken are in the 140 class areas because of our limited hunting, food available, and woodlot cover. All licenses are available over the counter and there are no point restrictions. Last year 7 out of 9 hunters averaged 150 B&C Score!